I’ve missed the last 2 seasons of KCW (Kids Clothes Week), so I was determined to participate in this one. As luck would have it, we are away the entire week, so I made Froo & Boo’s outfits last week and photographed them wearing their new outfits this week! 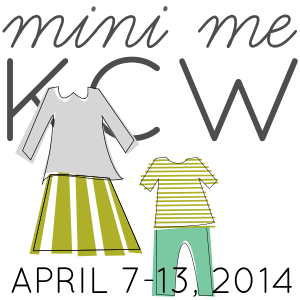 The theme for KCW is “mini me”. I already have several examples of handmade “mini me” garments with both Froo (matching dresses / shirts) & Boo (grey shirts), so instead, I thought Boo could be Froo’s “mini me”. Besides, they were both in need of a pair of easy-wear bottoms and spring-time shirts. 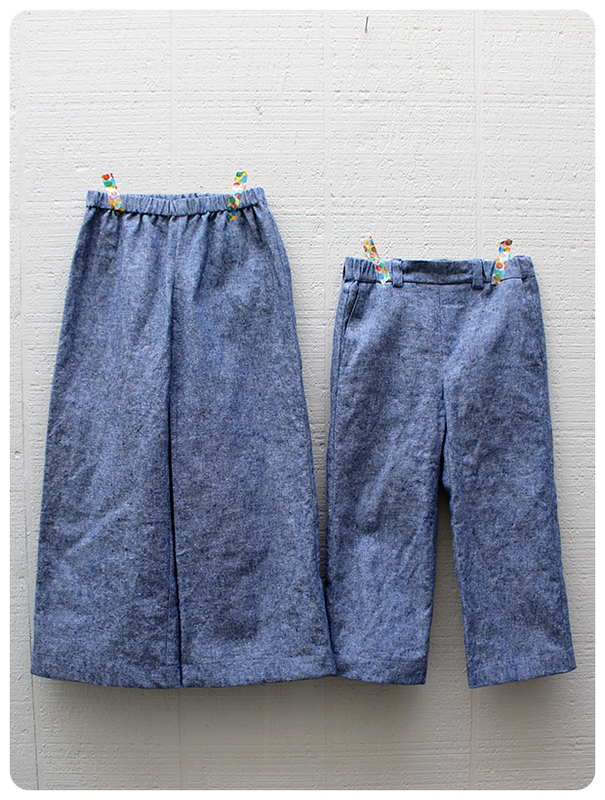 For Froo & Boo’s bottoms, the common fabric is Essex yarn dyed linen in denim. The fabric looks like chambray, but with the linen content, has a more textured feel. 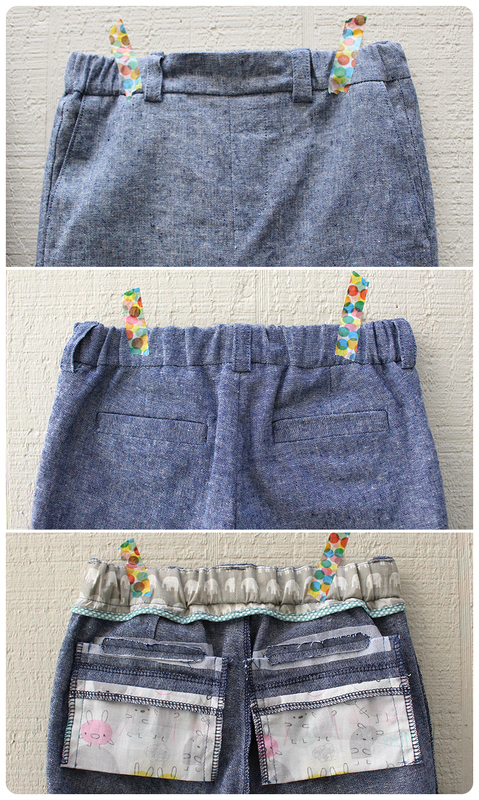 Froo’s pants are pattern “O” from the book, Happy Homemade: Sew Chic Kids. Boo’s pants are the art museum trousers by oliver+s. If the combo looks familiar, it’s because I repeated the bamboo knit versions I made for Project Run & Play. Can’t go wrong with what works! While Froo’s pants are wonderfully simple, I love the details of the art museum trousers! The welt pockets took some time sewing in, but give the trousers a professionally finished look. The pockets look a little funky from the inside and I’m not sure if they will be comfortable sitting in–which shouldn’t be a problem, since Boo does not sit still. 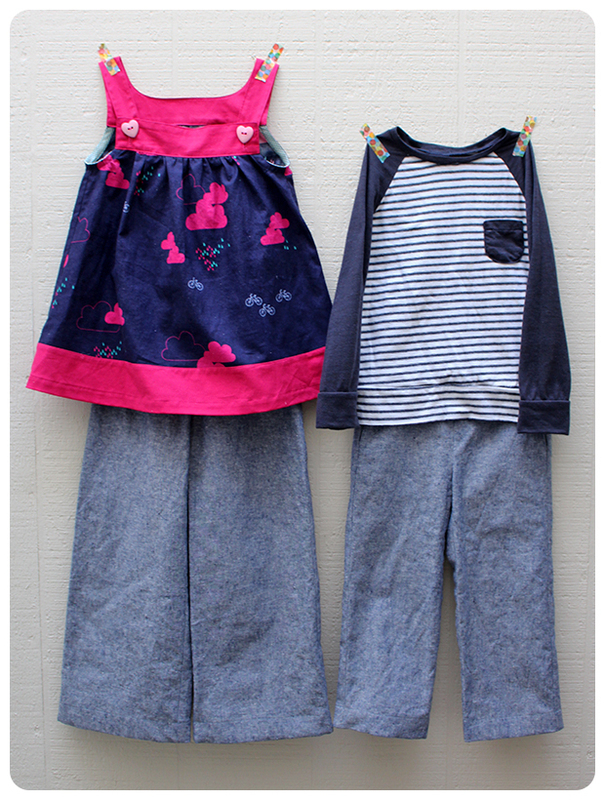 I thought navy blue would be the perfect pairing for linen pants since the colour works well for both girls and boys. 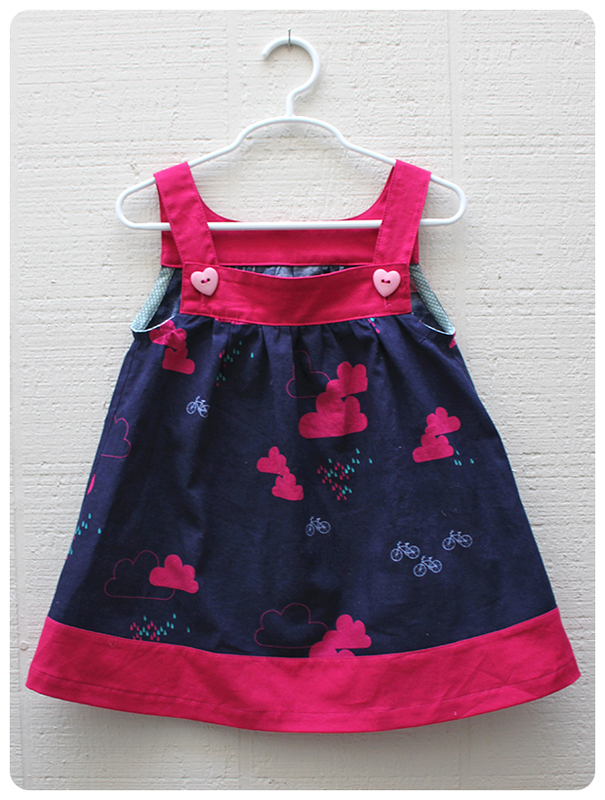 Froo’s pinafore is pattern “R” from the same book. I omitted the frilly sleeves and added a colour block hem, shortening the dress into a top. The navy blue fabric is part of the Uno collection, from the Danish company Stof. 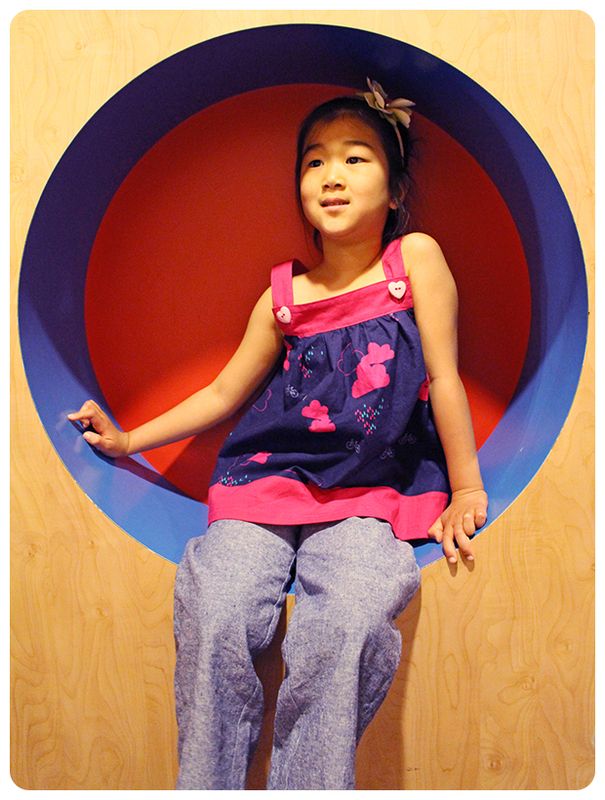 The bright pink fabric is Kona Cotton in Pomegranate–also used in Froo’s self-designed dress. I wanted to make Boo a super lightweight, long-sleeve shirt, using the field trip raglan pattern by oliver+s. I have a hard time getting Boo to wear a jacket, so long-sleeve shirts are our happy compromise. 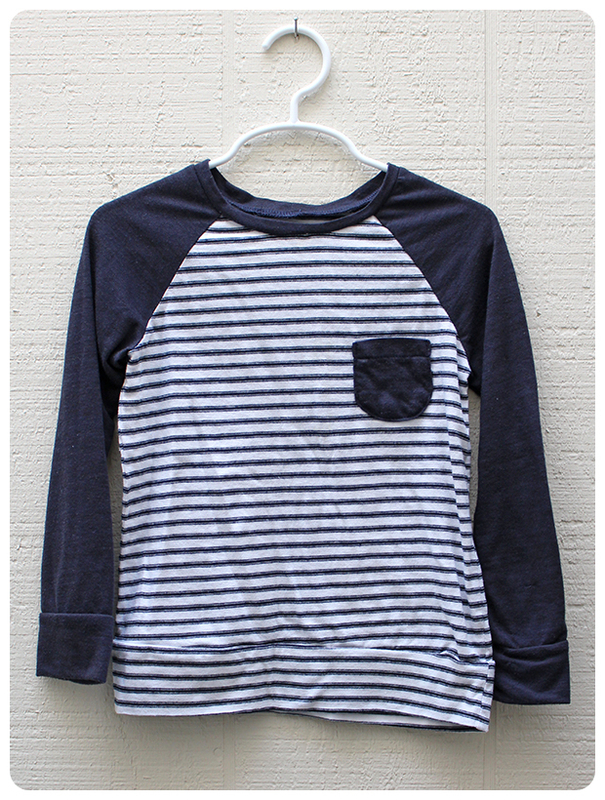 The navy slub knit sleeves are slightly sheer, but nice and soft. I added banded cuffs on the sleeves and hem for extra length. I even managed to match up the stripes on both sides! We have enjoyed an early start to spring break with a trip to Legoland, where we celebrated Boo’s 3rd birthday! We celebrated a little early, leaving Legoland yesterday, on Boo’s 3rd birthday. We took advantage of his last couple of days as a 2-year old to get free admission and meals. We are currently enjoying a great time in San Diego! Boo is in many ways, Froo’s “mini me”. He follows her, repeats what she says and mimics everything she does. 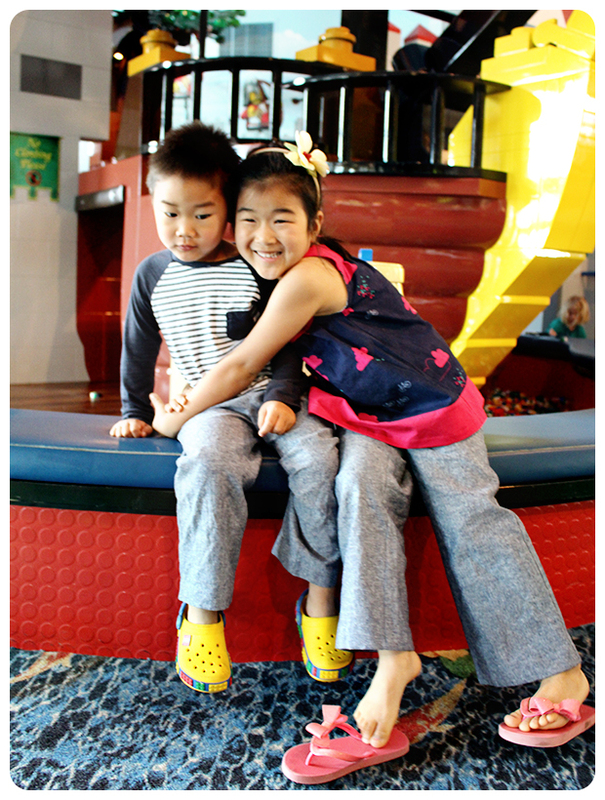 But with increasing age, begets increasing wisdom–he is completely unafraid of telling his sister she is wrong. Froo is unaccustomed to being told she is wrong–resulting in heated arguments between a 3 and 5 year old pair of accusatory (but loving?) siblings. My ears cannot handle the loud squabbles. I just need to remember the tender moments between them–usually when they are in cahoots, trying to hide something from me. Oh brother. Boo’s shirt stayed clean for roughly 30 minutes, until it was time for breakfast and became spotted with red smoothie. I can’t believe my Boo is 3! When I asked him if he was big or little, he responded with, “I’m a little bit big, but I’m still little.” I think I’m ok with that. xoxo.